Quick review of Virtual Dogs. Virtual Dogs is about as good as it gets for racing games. I’ve played a number of racing games online and Virtual Dogs is one of the best. All of the betting options you could want are present and the actual race itself is tense and exciting. If I’m being honest, betting on dogs and horses isn’t really my cup of tea. I’m more of a cat man you see, but until "Virtual Cats" is released I’m going to have to settle for this. As far as racing games go it’s easy to see that this is a great effort. If you’re after a good virtual racing game, I’d highly recommend Virtual Dogs. Virtual Dogs fun rating - 81%. The most important part of any virtual racing game is the race bit. 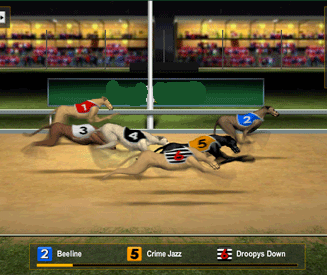 The Virtual Dogs race is realistic and does not allow for any obvious winner from the start. It also doesn’t allow for any unrealistic last ditch efforts from a dog 10 miles behind the pack to reach the velocity of sound and win the race in the final seconds, which is good. Basically, the Virtual Dogs race is believable and will keep your attention throughout. The graphics are a little sketchy, but the race structure more than compensates for that. Aside form the actual race you have the betting options, which are very flexible. You can bet on any dog to finish first or place in the top 3. You also have the option of betting on the exact first and second place finishers. Good betting options + realistic race = fun virtual racing game. How to play Virtual Dogs. Make your bets before the race. Hope that Lassie finishes first. As with any virtual racing game, just place your bets and hope for the best. You can choose between a 6 and 8 dog race before you bet. Different dogs have different odds and chances of winning. Dog number 1 has the best odds and these odds widen from one dog to the next (up to dog 6 or 8). You have the option of watching the entire race, or simply skipping straight to the final results after you have placed your bets. 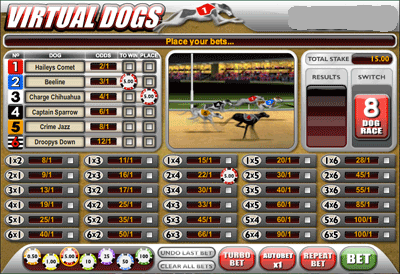 There are two main betting options in Virtual Dogs. Bet on any dog to finish first in the race. Bet on any dog to finish first, second or third. Bet on the dog to finish first and the dog to finish second. The longer the odds for the dog, the more you will win if it comes in. Fact: The longest odds you can get in Virtual Dogs is 200/1 for an 8-dog race and selecting dogs 8 and 7 to finish 1st and 2nd respectively. Before you finish placing your bets you have the option of turning "Turbo Bet On", which will simply show you the results rather than the whole computer-generated race. It’s a quicker way to bet, but it’s far less exciting. Aside from that, all you can do is sit back, shout "come on my son" in a gravelly voice and hope for the best.